Of all the Mick Jones-supervised 2014 remasters, this is the one in which there is little difference between this and the 1999 remaster. The others sound revelatory, not so much on this one, for whatever reason. Released in 1982, this was the last proper Clash album, and, to be honest, the one to which I return to least frequently. Unlike many, I have never liked the Stonesy and incredibly popular “Should I Stay Or Should I Go”, and also, as the old “side two” progresses, the songs get increasingly lazy and unappealing, particularly “Inoculated City” and the rambling, jazzy “Death Is A Star”. The half-formed, experimental “Sean Flynn” could fall into that category, but it has a sort of atmospheric appeal to it. The same is true of "Ghetto Defendant", which is very beguiling, with its spoken lyric part about Jean Arthur Rimbaud and the Paris commune. "Atom Tan" is ok, but doesn't really get anywhere with its slightly clumsy vocals, but Paul Simonon's "Red Angel Dragnet" has a gritty, bassy appeal. Half reggae, half funk it has a mysterious allure to it added to by Simonon's odd semi-spoken vocal. 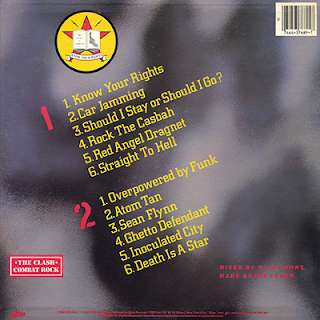 My personal favourites, however, have always been the quirky, rhythmic “Car Jamming”, the visceral, confrontational “Know Your Rights” and the monumental, evocative Vietnam-inspired “Straight To Hell”, with its intoxicating South East Asian percussion sound and moving narrative. “Overpowered By Funk” tries to continue where “The Magnificent Seven” left off, with its frantic rhythm, but doesn’t quite get there, for me, despite having good points, such as being packed full of witty lyrics. 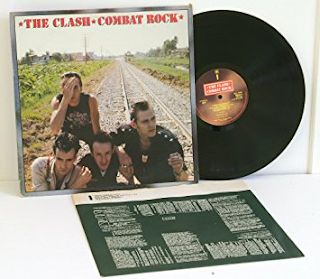 “Rock The Casbah” was an absolutely great single too, with a killer chorus and catchy piano riff. Overall, it is not a bad album, but only a “good in parts” one. You could somehow feel the lack of cohesion within the band's dynamic, though. It definitely comes across in the songs and their running order. The first half of the album (the old "side one"), is definitely the superior. 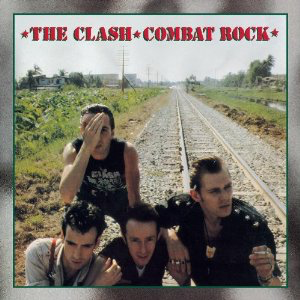 Not long after this The Clash as we knew them were no more. That was no surprise, really. However, let it not be forgotten that it had been five simply great years.